Preservation is about the future, and as preservationists we make choices about the historic sites and structures that we want to steward in the years to come. It is difficult for many to understand the importance of recognizing places from our recent past, particularly when personal taste drives a reaction to a building, or when that history is difficult to accept. The architecture of the recent past, particularly highly-visible landmarks, are often victim to the tyranny of taste. Yet taste changes, and we are glad that those who gleefully removed all of the “ugly” Victorian courthouses were not successful in removing every vestige of the late 19th century. Similarly, architectural landmarks of the mid-20th century are often viewed as being “ugly.” It is incumbent upon us as preservationists to understand and interpret the architecture of our recent past, so that we can ensure that the architectural and engineering accomplishments of the last century can endure. The agricultural history of south Texas merges with the region’s remarkable mid-century modern architectural legacy in this packing shed designed by architect Alan Tanaguchi in 1961. 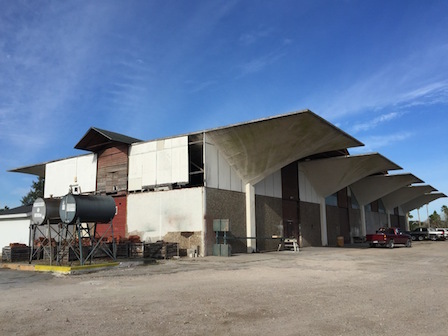 This building is representative of the many endangered mid-20th century architectural landmarks at risk in the Rio Grande Valley region of Texas.